West Ham showed they have some steel to go with their new-found attacking flair after salvaging a point against Stoke thanks to a spirited late comeback. Stoke had dominated for the first hour and deservedly led through goals from Victor Moses and Mame Biram Diouf. At that stage, a Hammers fightback looked unlikely but Enner Valencia's header gave them hope and Stewart Downing's 73rd-minute strike completed their recovery. Sam Allardyce's side had risen to fourth place in the Premier League on the back of three straight wins, including last weekend's impressive victory over Manchester City. West Ham - without in-form striker Diafra Sakho because of a shoulder injury - were way below their best at a blustery Britannia Stadium but showed they have resolve to add to their more attractive playing style this season. Stoke dominated the first half with Bojan Krkic, starting a league game for the first time since mid-September, full of neat touches and Jon Walters and Geoff Cameron linking up well on the right. It was from that flank that Moses opened the scoring after 33 minutes. The Hammers failed to deal with a Cameron centre and after Bojan's cross was blocked, Moses pounced from close range. Things could have been worse for the visitors before the break, but keeper Adrian brilliantly blocked Diouf's shot after he span away from James Collins inside the box. The Hammers did not manage a shot on target in the first 45 minutes so it was no surprise to see Allardyce - who started with one striker - revert to two up front at the break, with Carlton Cole sent on to support Valencia. Stoke continued to press forward, and deservedly extended their lead after 56 minutes when Diouf headed home after good work by Walters down the right. 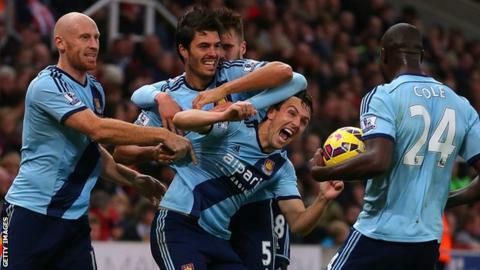 Only in the last half-hour did West Ham come to life, and Downing was at the heart of their revival. With Stoke still complaining about a wild-looking Alex Song challenge on Diouf that had gone unpunished, the ball broke to the former Liverpool winger on the right and he delivered a perfect floated cross for Valencia to nod home at the far post. The Potters almost restored their two-goal lead when Steven Nzonzi was denied by Adrian but, instead, the Hammers completed their comeback. Valencia was the creator, with Downing meeting his pull-back from the left with a fierce strike that Asmir Begovic could not keep out - denying Stoke victory on manager Mark Hughes's 51st birthday. Stoke manager Mark Hughes on the unpunished Alex Song challenge in the build-up to West Ham's first goal: "It was dangerous play. It was reckless. We're grateful that Diouf jumped out of the way, because it could have been a nasty collision. "The referee should come down on challenges like that - he needed to stop play, but apparently he was trying to play an advantage, which we didn't get. But it's not the first time we've been disappointed by a referee this season. "I think everybody at the game knows who were the better side, and who created the most chances. Unfortunately, sport doesn't always give the spoils to the team who deserve them." West Ham manager Sam Allardyce: "When you're 2-0 down away from home anywhere in the Premier League, getting anything is a terrific comeback. For us, that's what it had to be. "I always thought there was a goal in us. We changed the shape of the team and went for it, knowing we'd either lose 3-0 or get it back to 2-1, at which point Stoke might get nervous. "Stewart Downing scored with his right foot. People think he's all left foot, and he isn't. We moved him into the middle from the wing, and he made a terrific difference." Match ends, Stoke City 2, West Ham United 2. Second Half ends, Stoke City 2, West Ham United 2. Attempt blocked. Ryan Shawcross (Stoke City) right footed shot from outside the box is blocked. Corner, Stoke City. Conceded by Aaron Cresswell. Foul by Carl Jenkinson (West Ham United). Delay in match Adrián (West Ham United) because of an injury. Ryan Shawcross (Stoke City) wins a free kick in the attacking half. Attempt missed. Geoff Cameron (Stoke City) left footed shot from the centre of the box is close, but misses to the left. Assisted by Jonathan Walters with a cross. Substitution, Stoke City. Charlie Adam replaces Bojan. Corner, Stoke City. Conceded by Carl Jenkinson. Attempt saved. Bojan (Stoke City) right footed shot from outside the box is saved in the centre of the goal. Assisted by Steven N'Zonzi. Attempt blocked. Alexandre Song (West Ham United) left footed shot from the left side of the box is blocked. Assisted by Enner Valencia. Attempt missed. Enner Valencia (West Ham United) right footed shot from outside the box is close, but misses to the left. Assisted by Cheikhou Kouyaté. Goal! Stoke City 2, West Ham United 2. Stewart Downing (West Ham United) right footed shot from the centre of the box to the bottom right corner. Assisted by Enner Valencia. Attempt missed. James Collins (West Ham United) header from the centre of the box misses to the left. Assisted by Stewart Downing with a cross. Corner, West Ham United. Conceded by Bojan. Kevin Nolan (West Ham United) wins a free kick in the attacking half. Attempt missed. Mame Biram Diouf (Stoke City) header from the centre of the box is close, but misses to the left. Assisted by Erik Pieters with a cross following a set piece situation. Corner, Stoke City. Conceded by Alexandre Song. Mame Biram Diouf (Stoke City) wins a free kick in the attacking half. Substitution, West Ham United. Kevin Nolan replaces Mark Noble. Bojan (Stoke City) wins a free kick in the attacking half.